At 18.57 hours on Sunday, 26 May 1940, the Admiralty issued the directive which instigated the start of Operation Dynamo. This was the order to rescue the British Expeditionary Force from the French port of Dunkirk and the beaches surrounding it. The Admiralty believed that it would only be able to rescue 45,000 men over the course of the following two days, ‘at the end of which’, read the signal to Admiral Ramsey at Dover, ‘it was probable that evacuation would be terminated by enemy action’. The Admiralty, however, was wrong. Between 26 May and 4 June 1940, when Dynamo officially ended, an armada of ships, big and small, naval and civilian achieved what had been considered impossible. In fact, in this period a total of 338,682 men had been disembarked at British ports. Such a figure has exceeded the expectations of most. Little wonder, therefore, that an editorial in The New York Times at the beginning of June declared, ‘So long as the English tongue survives, the word Dunkirk will be spoken with reverence’. 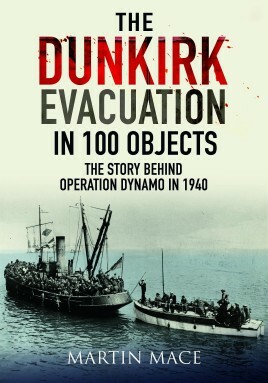 Through 100 objects, from the wreck of a ship through to a dug-up rifle, and individual photographs to large memorials, all of which represent a moving snapshot of the past, the author sets out to tell the story of what came to be known as The Miracle of Dunkirk. The full-color photographs of each 100 items are accompanied by detailed explanations of the object and the people and events which make them so special or relevant.